The Modena Challenge sports car was, like the Challenge Stradale, based on the 360 Modena but, in this case, it was not a legal road-going car. 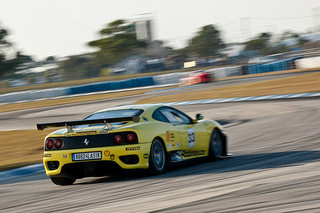 Instead, it was a modified racer that was designed to compete in the single marque Ferrari Challenge Series as did its predecessors, the Ferrari 348 and 355 Challenge variants. Powered by a 3.6 litre, V8 engine, the 360 Modena Challenge developed 410 bhp at 8500 rpm, and 286 ft/lbs of torque at 4750 rpm, and produced a top speed of 185 mph, with a 0-62 mph time of 3.9 secs. Originally priced at $175,000, the 360MC (its alternative designation) was fitted with larger, lightweight Brembo carbon composite vented disc brakes all round, with extra cooling ducts, and linked to a race-tuned ABS system that was electronically controlled using Bosch ASR anti-lock and traction control. A much lighter-weight exhaust system and bumpers were included. The 360 MC was not provided with a factory produced kit to upgrade the basic car to track specification, as was the case with the 348 and 355 Challenge versions. In this case, the 360 Challenge was solely a factory built racer which provided greater scope for substantial weight reduction. It was for this reason that it could outperform the road legal variants even though power from the same 3.6 litre engine was much the same. In order to minimise weight, the interior was stripped of all non-essential fitments, such as air conditioning, soundproofing, interior trim, and electric windows. As a result, the total weight was reduced by 320 pounds, and yet it was still 300 pounds lighter than the 355 Challenge car. It was fitted with a roll cage, a carbon fibre racing seat and harness, a larger anti-roll bar, racing springs, and a fire suppression system. All the instruments were replaced by a Magneti Marelli LCD display panel positioned on the bulkhead. The suspension was modified, and included adjustable racing dampers. It retained dry sump lubrication and the two Motronic ME 7.3 engine control units, whilst the exhaust system had only one catalytic converter which helped improve output. It was capable of producing nearly 400 pounds of aerodynamic down-force when driven hard. Since the manual gearbox was not available on the 360MC, it had a six speed F1-style paddle shift gear change, with the right hand paddle for changing up having been extended by around an inch in order to make gear changing easier whilst turning the wheel. 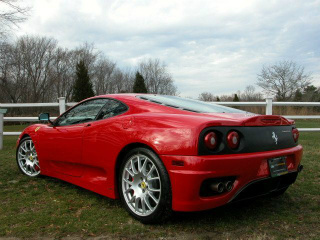 A Ferrari 360 Modena Challenge in excellent condition sold at auction for $91,000. 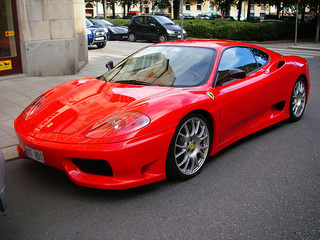 Yet another of the classic cars from Ferrari.